Xiaomi is the undisputed market leader when it comes to smartphones sales in India, topping the chart for the third Largest E-Commerce Platform with 30.3% market share as of May 2018. But that's not all, as the high smartphone sales have also made the company's online shopping portal, Mi.com, the third largest e-commerce platform in India when it comes to online smartphone sales figures.
" Mi.com is the now 3rd largest E-commerce platform in India"
Xiaomi's Global Vice President Managing Director Manu Kumar Jain tweeted today citing a counterpoint report. He later added that Xiaomi is an internet company with an increasingly efficient e-commerce platform'. 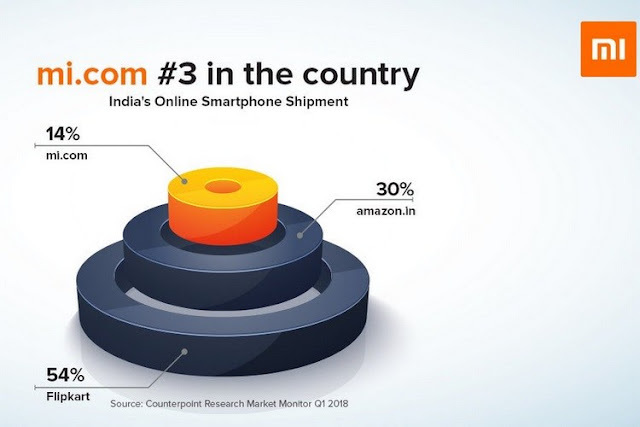 According to the latest market research from Counterpoint’s Market Monitor service, Mi.com is the third largest online retailer in India with 14% market share. Xiaomi’s e-commerce site trails Flipkart which has a market share of 54% while Amazon sits in the second spot with 30% share of the total online smartphone sales as of Q1 2018. Overall, e-commerce sites accounted for 38% of the total smartphone sales in India during 2018’s first quarter, which is a record in itself. As for the highest selling smartphones in India, Xiaomi takes the cake here too, with four of the top five best-selling smartphones in India being a Redmi device. The Redmi 5A, Redmi Note 5 and the Redmi 4 occupy the top three spots, while the Honor 9 Lite sits at the fourth spot followed by the Redmi Y1. When it comes to online smartphone sales, Xiaomi accounts for more than half of it with a 57% share as of Q1 2018, while Samsung remains a distant second with a paltry 14% share and Huawei taking the third spot with 8%. The top four Xiaomi smartphones alone accounted for 40% of the total online smartphones sales in India in Q1 2018, which is simply astonishing. Xiaomi’s smartphones continue to sell like hotcakes and with their demand increasing with each passing day, it appears that Mi.com’s share will only grow with time.